Olivia Cleans Green: Is Rubbing Alcohol Safe? What are Alternatives? 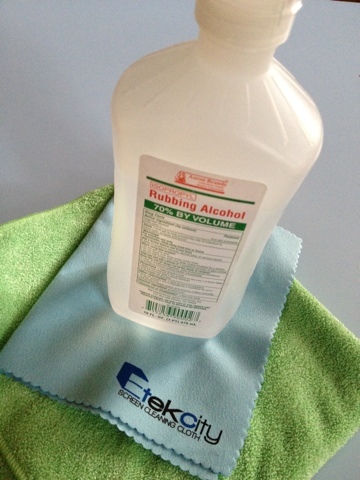 Isopropyl alcohol, aka rubbing alcohol, is innocuous in most homes. It's used to clean scrapes, sterilize objects, and included in lots of personal care and cleaning products. Recently, I've noticed that some green companies like Better Life make a point of saying their cleaning products don't contain it. I wondered why. Should I Be Concerned About Rubbing Alcohol? Read the MSDA for Isopropyl Alcohol (PDF). Read the OSHA report for Isopropyl Alcohol. I don't know about you but this is all scary and surprising for me. However knowing there are alternatives is comforting. eHow details how you can use hydrogen peroxide, witch hazel, and vinegar in place of rubbing alcohol for personal care and cleaning. I use a 50/50 mix of rubbing alcohol and distilled water to clean my HDTV screen, but I hear using plain distilled water in the same manner, ie a wee bit along with a microfiber cloth made for glass, totally works. I imagine it just doesn't dry as fast. I love using rubbing alcohol to remove stickers, labels, and goo. I did some quick internet research and discovered you can remove them with a hair dryer, vinegar, vegetable oil (Tipnut says leave on for 2 hours), and peanut butter too. My favorite pet mess cleaner, Nature's Miracle, contains isospropyl alcohol. I'm reluctant to give it up entirely since it works so much better than anything else I've tried. Still, knowing that it contains a respiratory, mucous membrane, and skin irritant means I'll be mindful to keep it out of reach of visiting children, wear gloves when using it, and crack open some windows while I use it and while it dries.